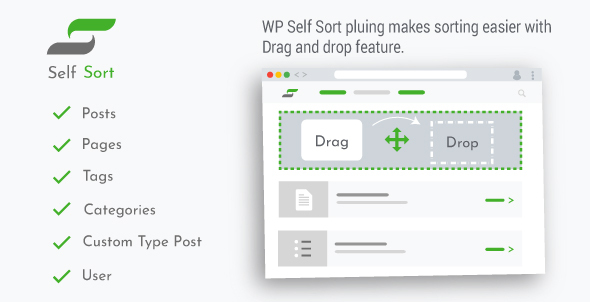 WP Self Sort is a powerful plugin sorting the order of posts, categories, tags, custom post types, users and plugin list by using a Drag and Drop with jQuery UI Sortable. The order can be customized with in default WordPress post type and custom post type’s list page. Its allow to reorder the posts and categories for any default and custom post types. Do you want the client to see only the order of posts you want to view your website? That Plugin is usable for you. Install this plugin and activate. After the installation and activation WP Self Sort appearing left menu. Click on WP Self Sort and select the following which you want sort the order. If select the posts go to post list page and sorting of posts capability available. You sort the post by using Drag and drop. After the sorting you see front end list of posts reorder and set the list according your sorting.